Tis the season for the return of Fruit or fruity beers, and while they are not for everyone, this could be your opportunity to open your mind and your beer palate, to what I believe will a continuing trend in beer flavors and styles. So how do these popular spring and summer brews fit into your life? My suggestion is to use the same strategy many use when trying a new brewery or a new style, find a gateway beer. 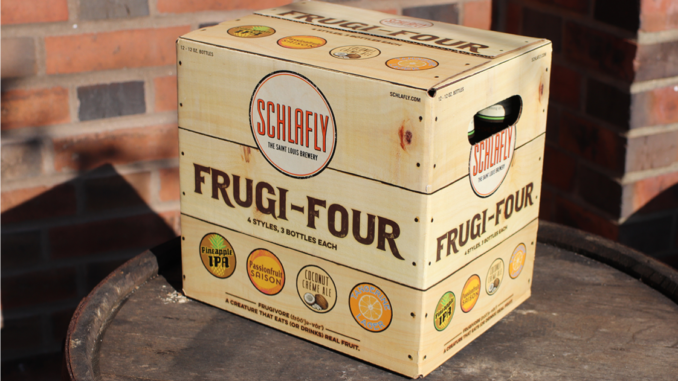 This week, Schlafly may have done you the favor by introducing this year’s version of their Frugi-Four Pack, a 12-pack sampler showcasing four distinct beer styles that highlight four different fruits. The 2018 series includes 3 bottles of each of these beers – Pineapple IPA, Passionfruit Saison, Coconut Crème Ale and Tangerine Lager. The Passionfruit Saison (6.0%), a cloudy wheat beer with sweetness and spice with depth and subtlety. After a successful tasting at Schlafly’s Hop in the City and Cabin Fever festivals, Tangerine Lager (5.5%) makes it to packaging as a traditional lager with a touch of sweetness. Tropical-inspired styles are perfect for summertime, including the Pineapple IPA (6.0%), the perfect mix of hoppy, fruity beer and juicy pineapple, and Coconut Crème Ale (5.5%), the American-style wheat ale created by fermenting coconuts and pineapples and then aging the beer on toasted coconut flakes. Schlafly Beer’s Frugi-Four Sampler Pack will be available for purchase in St. Louis and across Schlafly’s distribution on April 23, 2018.